A AutoCompleteTextView is a view that is similar to EditText, except that it shows a list of completion suggestions automatically while the user is typing. The list of suggestions is displayed in drop down menu. The user can choose an item from there to replace the content of edit box with. Following are the important attributes related to AutoCompleteTextView control. android:completionHint. This defines the hint displayed in the drop down menu. android:completionHintView. This defines the hint view displayed in the drop down menu. android:completionThreshold. This property will define the number of characters that the user must type before completion suggestions are displayed in a drop-down menu. android:dropDownAnchor. This is the View to anchor the auto-complete dropdown to. android:popupBackground. This sets the background. Add the following snippet to activity_main.xml. Accessing AutoCompleteTextView string data from selection is very easy because there are already a pre define function getText() available for retrieve entered value. You can handle the AutocompleteTextView item click event using setOnItemClickListener() method. Place below lines of code in onCreate() method. Also you can handle the AutocompleteTextView field click event using setOnTouchListener() method. Place below lines of code in onCreate() method. Android provides several text decorating attributes like Typeface, font family, text style, text size, text color, text shadow etc. that can be applied to AutoCompleteTextView. Also we can use SimpleCursorAdapter instead of ArrayAdapter. The following example code would typically be found in the onCreate() method of the Activity that contains the AutoCompleteTextView. It retrieves the AutoCompleteTextView from the Activity's layout, creates a SimpleCursorAdapter, configures that SimpleCursorAdapter to work with the AutoCompleteTextView, and then assigns the Adapter to the View. You can define custom adapter, as described here. MultiAutoCompleteTextView is same as AutoCompleteTextView but first can hold multiple string words value at single time. These all values are separated by comma (,). 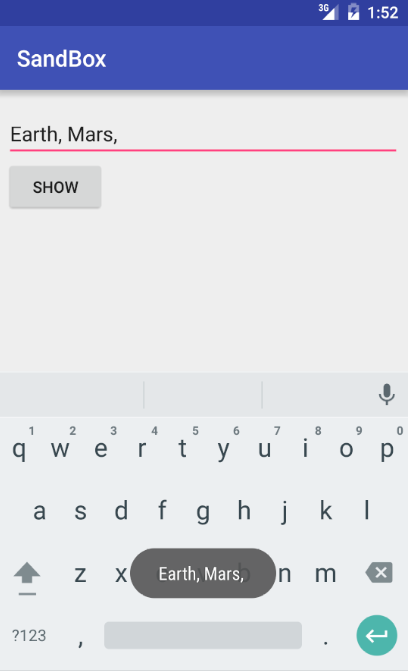 Android AutoCompleteTextView is the subclass of EditText class. The MultiAutoCompleteTextView is the subclass of AutoCompleteTextView class. Add the following code to MainActivity.